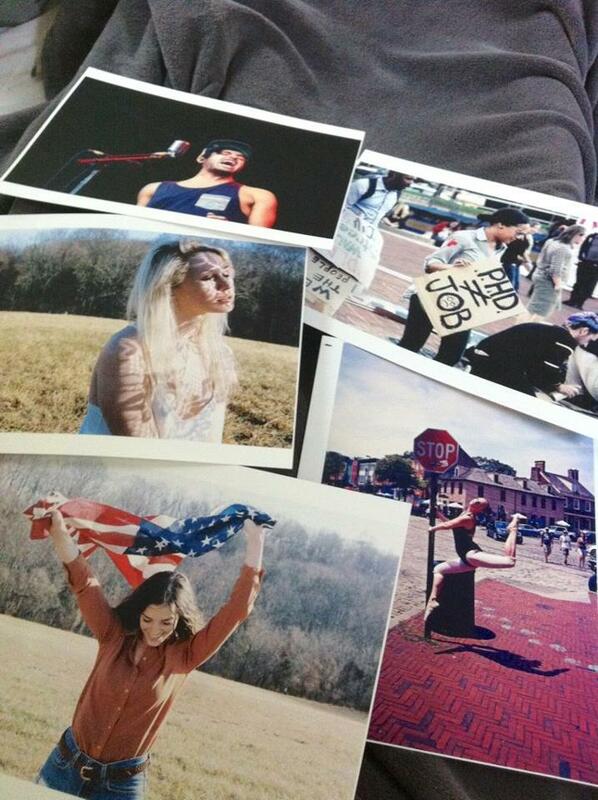 Prints for my portfolio. People look at screens all day, I enjoy giving them something to hold and to view instead. Andrew did these for me, using an Epson printer, matte professional paper and resizing done in Photoshop. Mixture of film and digital works. I know I lightly touched on this topic before, but it seems to keep coming up. In this age of technology, we have access to really great tools that can take art from one level and transform it to something magnificent. I also feel that in this time of technology, we are losing what makes art so special. Recently, I pieced together a print portfolio. There is something special about being able to physically hold someone’s art instead of sharing it with them via computer screen. We look at screens all day. There’s a good amount of tweaking and work that goes into making a solid print and it’s an art that is almost forgotten by the general public. Why have we sacrificed the print as a physical object to the internet when the print gives so much more of an impact? Is it because we have become lazy to make prints or to go view them? Or is it because people so often share things through social media that the internet is the best way to share things we like with others? Does anyone else ever think about this? Even magazines and newspapers are slimming down their sizes in order to go fully online. Newsweek just published its last print issue last week. Andrew bought it for me for $7. So, how does this correlate to film? Well, before digital scans and digital printing, film photographs were printed in the darkroom. They required an enlarger, photo paper and precision to make a nice, sharp, clean print. No print was exactly the same, they were all done by hand. This doesn’t go without saying that digital also requires precision and tweaking in order to get a true color rendition from screen to your hands just through different methods. Polaroids are the best example I can think of to demonstrate my point further. People who aren’t photographers by trade even relish in the idea of having something physical from their memories; a cute, little Polaroid print. People put them on their mirrors, clip them on their car visors, put them in their wallets, or even tape them to school books and binders. The fact that a physical object, one that you can hold and carry, can come from a photograph still grabs ahold of people. What do you think? Do you think that prints are an object on their own, a separate art entirely? Or do you think that prints and online viewing are interchangeable? Popular Movies Still Shot Using Film, Surprise! One of my greatest joys is looking at the prints that I have and even more memories come from the ones my parents have. I think it is sad that society has evolved into one that keeps their precious memories on a computer rather then in a photo album that can be pulled out from the nearest bookshelf. I believe with film, during my younger years, polarioid specifcally, it captures that moment in time without any photo shopping. Film is pure, simple and natural. It’s a precious glance back. As a whole we have become a society of technology driven people that have become lazy. I am just as guilty of this. Sometimes I wish digital photography was never introduced. Well, I think the fact that you can save photographs to discs, hard drives, and other sources is a great method of preservation. I remember when I was younger and we lived in South Baltimore, some of our basements would flood. Basement floods on a box of priceless memories, and their lost forever. If we had discs with said pictures saved, they wouldn’t have been lost forever. I’m sure it has it’s disadvantages too, I just don’t know many as I don’t really see much of a difference in holding it in my hand, or seeing it before my eyes. They’re pretty close in comparison in my opinion. It’s funny you mention that because I have had the opposite experience! My hard drive crashed about three years ago, due to me illegally downloading music like an idiot and I lost all of my photos, about 40,000 of them. As in FORTY THOUSAND PHOTOS. I for one am a great believer in handheld photographs! I even take some photos family and friends post on line and print them. I do this so in the future I can look back at them. I agree they are not as clear as taking a photograph and developing it, but in todays technology it’s the best way for me to keep them close. As for myself I have hundreds of photos of me as a child (handed down by my mother), of my family (many members who have left this life), my children, and friends….many taken with polaroid film or a regular camera..they can never be replaced. Thank you for this article…. Andrew did a great job with the photos!…..don’t get me wrong…I do like my digital camera, but will always look back at my photos taken with film and reminisce….. I prefer the film prints, they just seem so much clearer and more vibrant. Love displaying them around the house and in my office. I like the easy access and distribution that digital photography allows, but I, too, had an incident where my computer crashed and I lost every picture stored, which I wished I had backed up on another computer or disc. but now are lost and gone forever.. if only I had printed out copies ..Hoping film never dies!! I think media in a digital format is a double-edged sword. When used as an additional tool you can reap great rewards. Digital doesn’t degrade over time. Provided you still have the file (photo) in 100 years it will be just as clear and colorful as the day it was taken. Another great benefit is distribution. A picture can be instantaneously sent to seemingly limitless people. My mother has recently been delving into digital photography, and she has also spent countless hours collecting old photos from various family members, scanning them and uploading them to the internet for everyone to see. I am grateful that I will always have those digital versions of old photos, but opening my computer is not the most fulfilling way to view them. I believe we have become so dependent on the newest technologies that we are losing something precious. I have seen family photos from the earliest part of the 20th century on the computer, but I’ve also seen those exact pictures as they were originally printed. Holding a piece of history means so much more than just seeing it. The folds, the tears, the imperfections… they just add to the experience. It takes you there. You can think to yourself, “The picture has been touched and held by my ancestors for generations.” That just makes the whole experience more… tangible. Film is by its very nature a more human experience than digital. Recording an image in a language we cannot actually fathom (computer language) takes away something crucial and just makes everything seem slightly artificial. Knowing something is completely a person’s handiwork, and not partly the work of a computer program gives something more meaning and a much deeper look into a person’s (i.e. the photographer) experience. I definitely hope film doesn’t go away, and I certainly hope we retain the ability to hold actual photos in our hands. It would be a loss to us as humans, much the same way CG graphics has replaced good stories and well conceived characters in movies. Thank you for this, what a great comment to further strengthen my point. Bravo! I agree with you and couldn’t have said it better myself. The tangible is what my main focus is on and that is being lost through technology so quickly that I feel like people don’t even realize it. “Film is by its very nature a more human experience than digital” –> Exactly. Both respected mediums but I couldn’t agree with you more on that statement. I believe art should be proudly displayed on a wall or table as a constant reminder of family,fun, and love. I also buy pieces that catch my eye so I can surround myself with their beauty. Technology is wonderful and I love digital images but they can’t compare to the instant gratification a lovely photo, drawing, or canvas can bring to someone as they step into your home. I love galleries of art. I could spend an entire day just going back and forth looking them over again and again. I can’t say that about digital. Although they are fabulous they just don’t seem tangible enough to hold my interest. I need to touch them to feel them. Yes! Art for ages has always been known as an object, whether it’s 2D or 3D and don’t get me wrong digital art is also art, but having it in front of you instead of viewing on a screen, even if it’s just on paper, really makes it come to life. Oh and I read an article on Yahoo the other day that said Polaroid is working on a comeback. Yep! I did a post awhile back where I bought the new film and tried it out. $25 for 8 exposures I believe, cool photos but nothing like the older kinds so I don’t think it was worth the price. It’s neat that they are compatible with the older model Polaroids though. There are new instant cameras that I think are pretty cool though!